Conair's most powerful clipper the HC1000 Fast Cut Pro comes with everything you need to do professional haircuts and trims right at home. 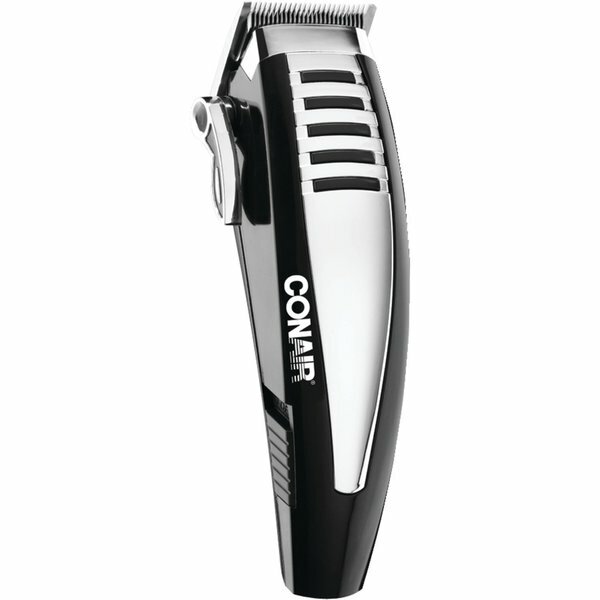 The Fast Cut Pro features the most advanced blade technology ever produced by Conair. Professional high carbon steel blades are driven by the state of the art powerful DC motor providing more torque and giving it a competitive edge. When compared to other brands the Fast Cut Pro cuts 2x the hair in a single pass. Taper control makes it easier to achieve expert quality cuts, trims, and detailing. Kit includes barber scissors, comb and cape, deluxe storage case, cleaning brush and oil, 2 styling clips and blade cover. A great item for any man. Easy to use, efficient and precise. Great for anyone who doesn’t have time to go out and get a haircut. Comes with an assortment of blade guides and very easy to maintain. Great gift for anyone. Highly recommended. These are wonderful and do a great cut. I have bought several clippers in the past and not had a great experience with any of them. I bought this item for my son, cuts even, quickly a very good product for the price. It broke while using it today. It worked great up until today when it broke. I don't know what caused it to brake like it did. The blade (the side that moves) is held in by springs and one of the 2 springs broke. I took it appart to find this out. These clippers have worked very well for my husband and son. There are several different attachments and settings on the clippers. The clippers have held up well and have been used several times. We apparently focused too much on the picture and thought it was a cordless trimmer. Works but wasn't what we had expected. Product is exactly what I expected! Did not work, loose pieces inside, piece of junk. "will it work with 220V ? if not, are there any adapters available"
This clipper is not cordless.